JEAN MICHEL BASQUIAT PRINT. This is a RARE, terrific hard to find Fine Art Print is by the Artist JEAN MICHEL BASQUIAT, who burst on the high powered New York City Art Scene in the Eighties and rose quickly to high speed fame. This is one of his most brilliantly colored paintings. A great piece to add to an art lovers collection. He Worked in joint collaboration with the likes of Andy Warhol which involved some 60 works, he had numerous successful one man shows and stared in a movie of his life directed by Julian Schnabel. This rare exciting print is great for collectors. Strong collectible print. 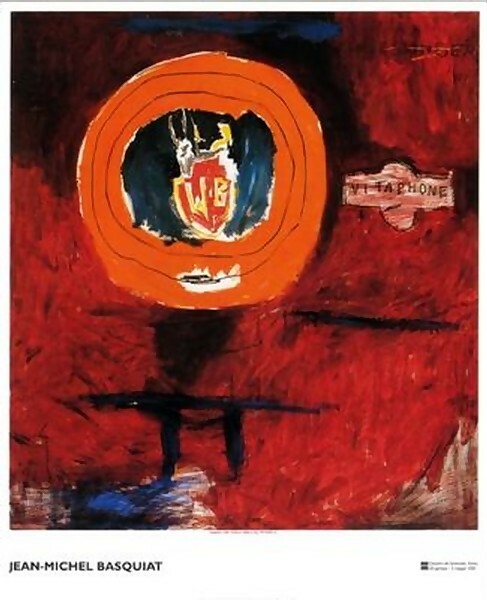 Click the button below to add the Rare Superb Jean Michel Basquiat Fine Art Print Vitaphone to your wish list.